Thumber - your only out is to win the Whitehorse Ice Bowl. It's set to go on Feb. 28th. Is there an "Its a balmy plus 5 but I'm still making a snowman on every hole" division? Let's say hypothetically, one was not able to make it to the Ice Bowl (not a wimp), but would like to boost the food bank numbers(cash). How would one go about this? Send it my way pls and thx. We will be selling discs at the event where the $$ goes to the Food Bank. We might have left over players pack discs too that you might be interested in. They will have a special stamp. Discs from the Canadian Championships will also be for sale, on February 13th. Or just do as the Tyrant requests; send him $$. Any info on the course? Should I look at previous Pineview threads? 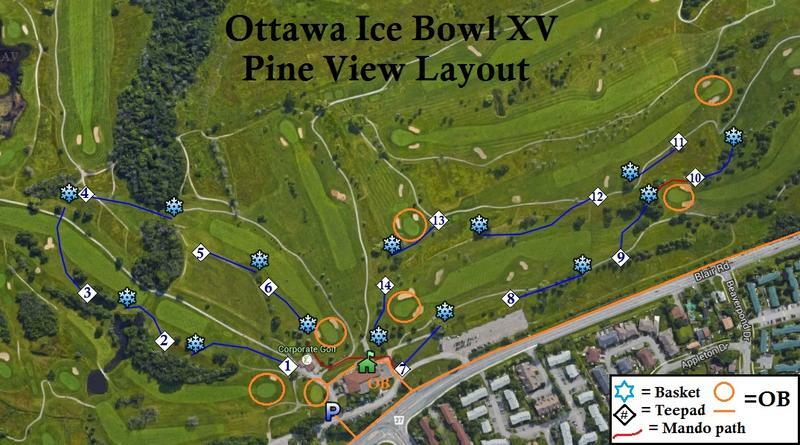 The greatest map ever to hit Ottawa DG events! Sub Zero - This is the top men's division, aka the Open (to all) division. Ice Queens - This is the top women's division, available to female players regardless of age or skill level. Above Freezing - This is the Amateur division, aka the I can't compete with those in the Sub Zero division. Warm Blooded - This is the Recreational division, aka the I can't compete with those in the Above Freezing division. And as always those who do not specify what division they would like to be in shall be appointed one. Same cost as last year with the same great value. 2! Daredevil Players Pack Discs! I prefer cash in hand for the Icebowl registration but I have been known to accept online payments.